Making things easier to do always helps with public acceptance and EV charging giant ChargePoint has added a “tap-to-charge” payment function to its network of more than 40,000 public plug-in vehicle chargers in the U.S. and Canada. The company hopes the new function will encourage more consumers to consider PEV purchases. ChargePoint users can now employ tap-to-charge smartphone function. The system works by interacting with the pay-by phone apps on iPhones (version 6 and higher), Android phones (version 4.4 and higher) and Apple Watches. While vehicle price is still a major factor in EV adoption, charger availability and charging convenience is as well. 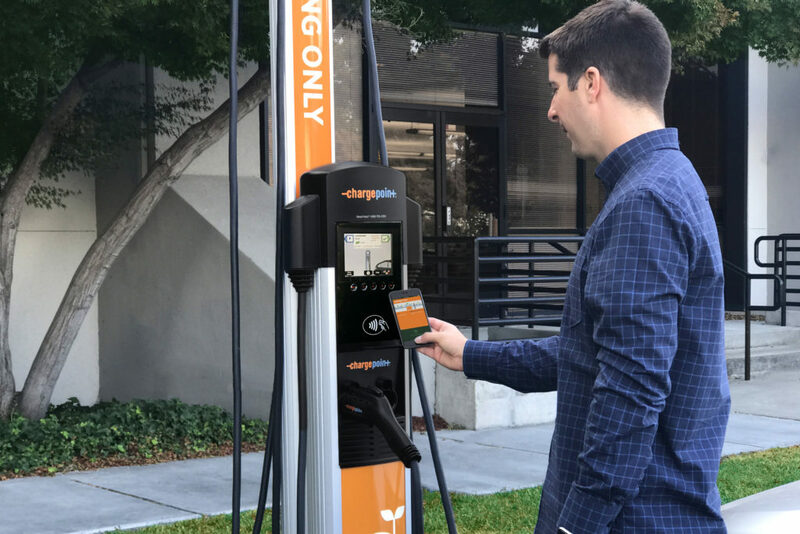 “Making it as easy as possible for drivers to charge” is a major step in improving plug-in vehicle convenience, said Colleen Jansen, ChargePoint’s chief marketing officer. The company claims it is the first plug-in vehicle charging network operator to enable a phone-based “tap-to-charge” function. It requires establishing a ChargePoint account and then enabling the proper pay-by-phone function on the appropriate smart phone (or Apple Watch) device.